It's your guarantee that when properly sealed and maintained, your countertop will be free of stains from common food and beverage for up to 20 years. Subject to the conditions and limitations stated in this document, Custom Building Products (CUSTOM) warrants to the authorized fabricator and/or applicator and original owner that the Aqua Mix sealer purchased will be free from manufacturing defects and will provide a stain-resistant seal against common food and beverages (such as but not limited to coffee, mustard, ketchup, juices, soft drinks and butter) under normal usage for twenty (20) years for interior residential counter tops; ten (10) years for interior commercial counter tops and two (2) years for exterior residential counter tops when applied in accordance with Aqua Mix’s most recently published instructions, specifications and guidelines for said installation. 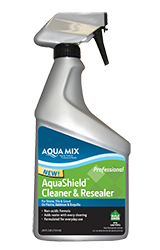 Installation must be sealed with Aqua Mix Sealer's Choice Gold and maintained with Aqua Mix Aqua Shield or any Aqua Mix everyday cleaner and resealer. All spills should be immediately cleaned. Warranty coverage applies to granite, marble and engineered stone counter tops. This warranty becomes effective upon registration of the project. Validation form must be registered with Custom Building Products within 90 days from substantial completion. This warranty is not transferable beyond the original owner of the countertop. Additional terms, conditions, limitations and restrictions apply. Refer to product technical data sheets for complete application use, safety, limitation and warranty information. Download full warranty at the link below. 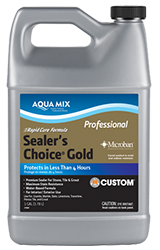 A premium sealer that provides superior stain protection in less than four hours. Excellent for use in food preparation and serving areas. The water-based formula offers maximum stain resistance for interior and exterior granite, marble, slate, limestone, travertine, porous tile and grout. A ready-to-use cleaner and resealer. Non-acidic, non-abrasive formula won’t damage stone, grout or tile. Cuts through grease, dirt, food and soap scum on tile, grout, chrome, glass and laminates. Contains sealer to reseal as it cleans.